Good day children! We are here today with another wonderful collection of a classic animated feature film after “The Lion King“, “Dumbo” and “Toy Story”. 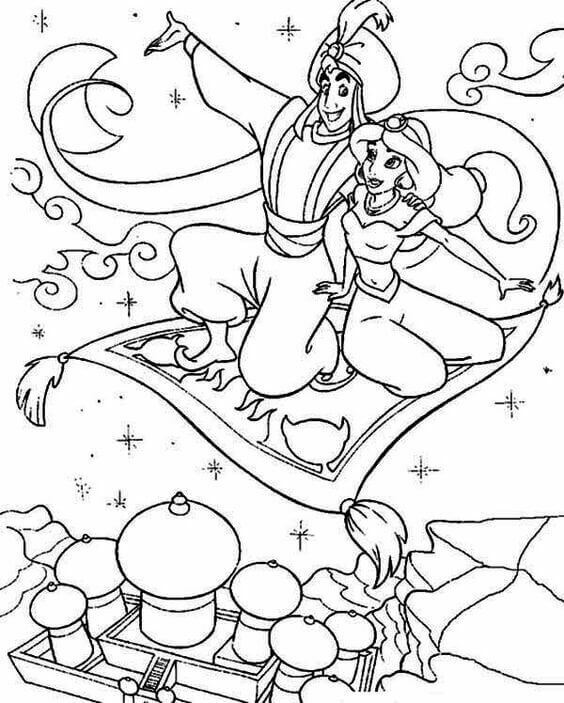 Get ready to take a ride on the magic carpet to the magical Arab world with our free printable Aladdin coloring pages. Released in 1992, “Aladdin” is based on an Arab folk tale and derived from “One Thousand and One Nights”. “Aladdin,” tells the love story of Aladdin, a street urchin and Princess Jasmine of Agrabah who wants to marry for love instead of being married off to some prince as the law dictates. This fantastical tale has a magic lamp, a genie and Oscar-winning musical score. 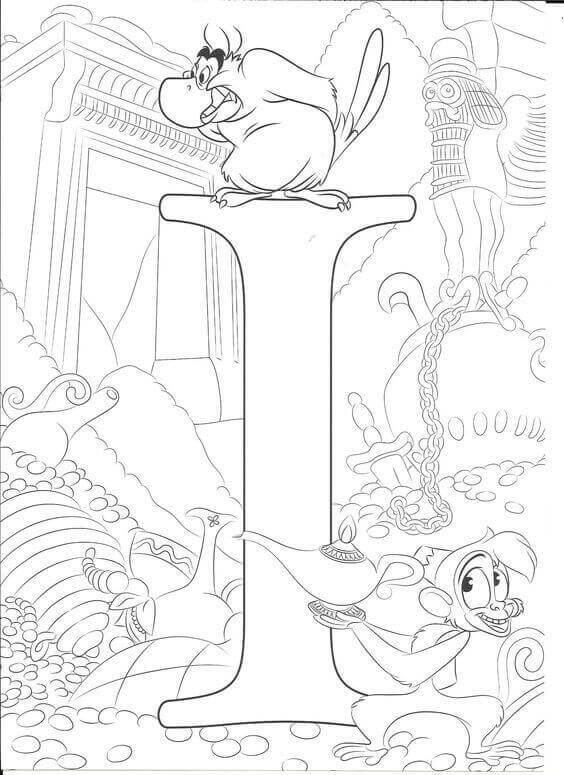 Let’s fly closer into this magical world with this collection of Aladdin coloring sheets to print. 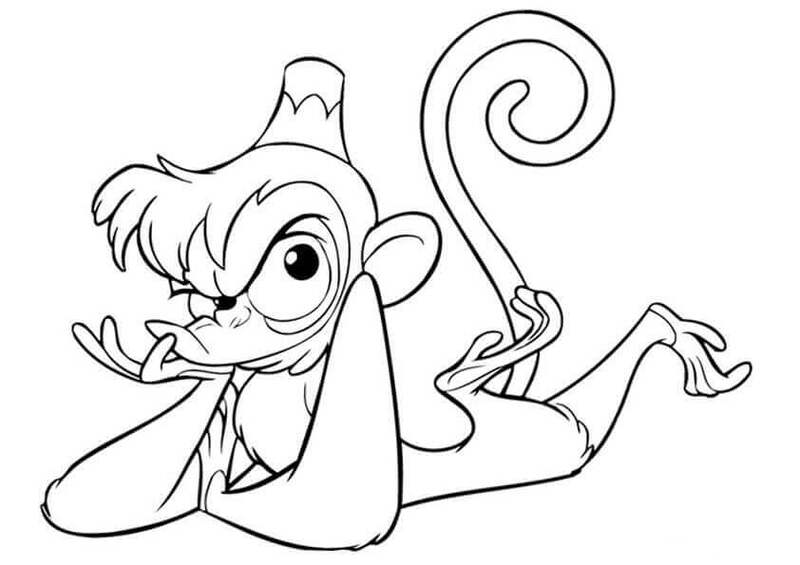 Abu, the monkey is Aladdin’s pet companion while Iago, the parrot is a personal assistant to Jafar, the Royal Vizier who plans on becoming a sultan. 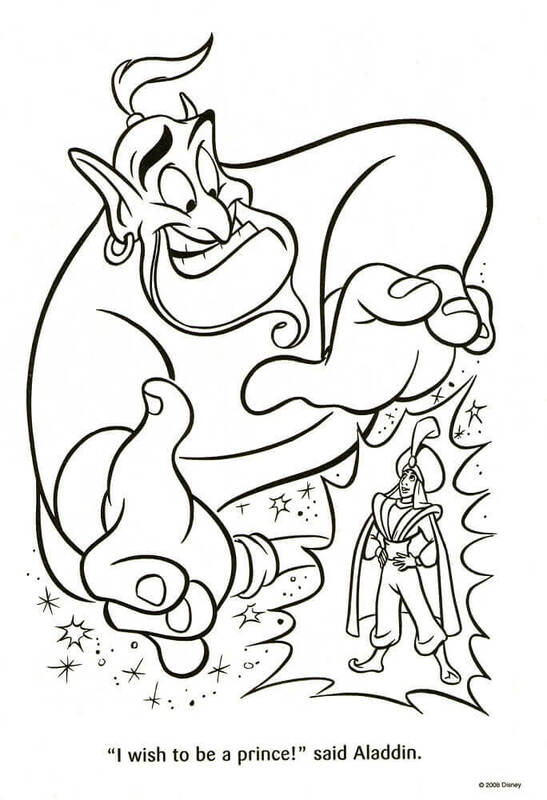 This illustration shows Abu, teasing Iago with the magic lamp in his hand. The short-tempered Iago seems to be getting irritated by the monkey’s antics. Print this page and give this interestingly funny illustration some lively colors. 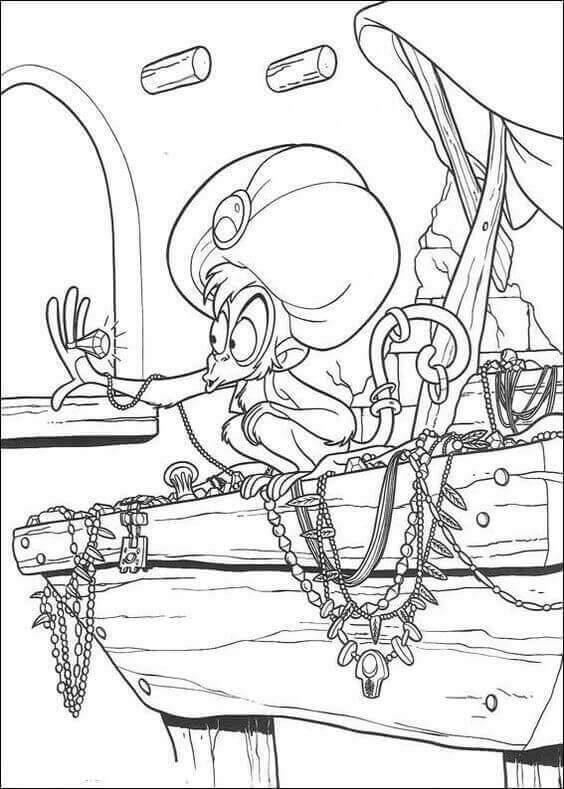 Always getting into trouble for being a kleptomaniac, Aladdin’s pet monkey Abu can always be found picking up something or the other wherever he goes. It illustrates one of the rare times when Abu is resting in one place, maybe he is plotting his next move and what all he can get. While he plots, print this page and fill colorful ideas in him. Curious and fascinated by all things shiny and sparkling, Abu is seen here mesmerized by all the gold around him. Look at him trying out everything, including gold embellished turban on his head and a shimmering ring on his finger. 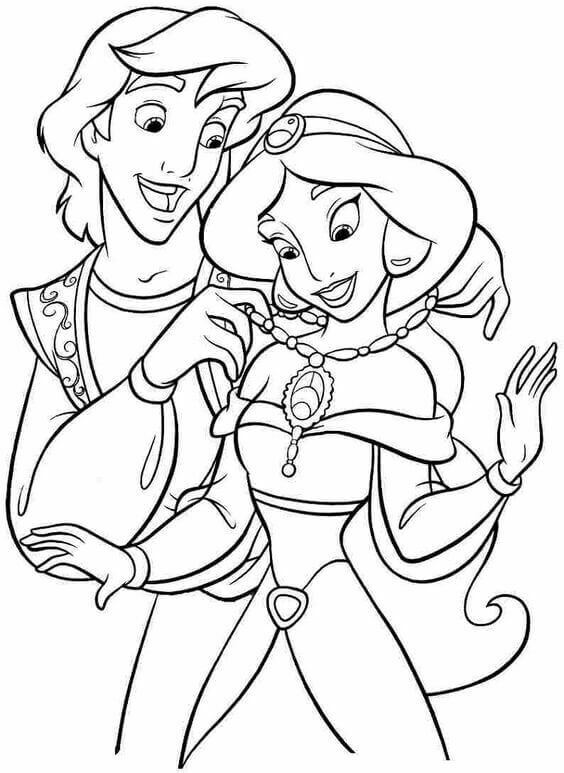 Aladdin showers Jasmine with gifts when he turns into a prince after getting his wishes fulfilled by the genie. He is happy to see her smile and his gift has been well-received. Print this page and give this tender moment of love some colorful magic with your coloring skills. 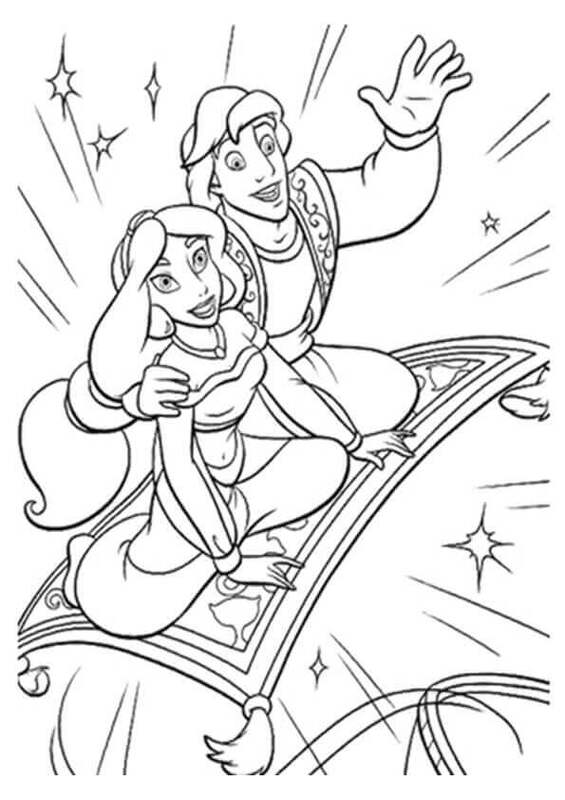 Aladdin asks Jasmine to join him on a magic carpet ride and when she does, Jasmine discovers a whole new world outside of the walls of her palace. They fly above the city of Agrabah and around the world, witnessing its numerous marvels. It does look like a fun and wondrous ride, doesn’t it? Let it feel more magical by printing this page and adding your colors. Determined to win the heart of Jasmine and be together with her, Aladdin had wished to become a prince as his first wish out of the three granted by Genie. 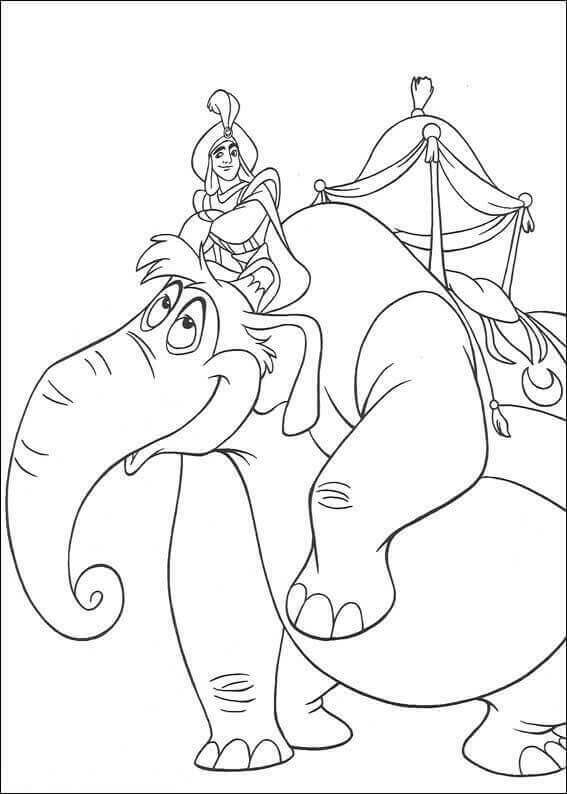 His wish came true and now he comes to Agrabah as a rich prince, riding on a royal elephant, to meet the Sultan and ask for Jasmine’s hand in marriage. One of the first time when Aladdin meets Princess Jasmine is by chance in the market. Look at Abu sneaking a peek at their awkward moment. 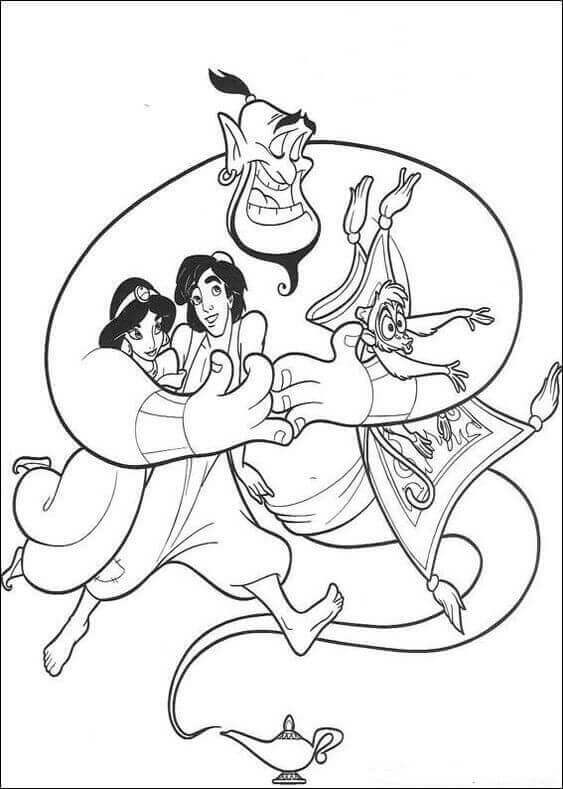 Print this page and give your favorite colors to this chance moment between Aladdin and Jasmine. Disney’s Aladdin was a major commercial as well as critical success. It was the first animated feature to collect half a billion dollars in worldwide box office revenue. Here you can find our street urchin hero Aladdin in one of the movie’s poster. Looks like he got himself into another trouble. When Princess Jasmine hears about her marriage to a prince instead of someone she falls in love with, she escapes from the palace. That was when she met Aladdin and the palace guards came charging at Aladdin thinking he had something to do with the escape of the princess. Flowers look so lovely, colorful and bright, don’t they? Getting flowers is always a good feeling. 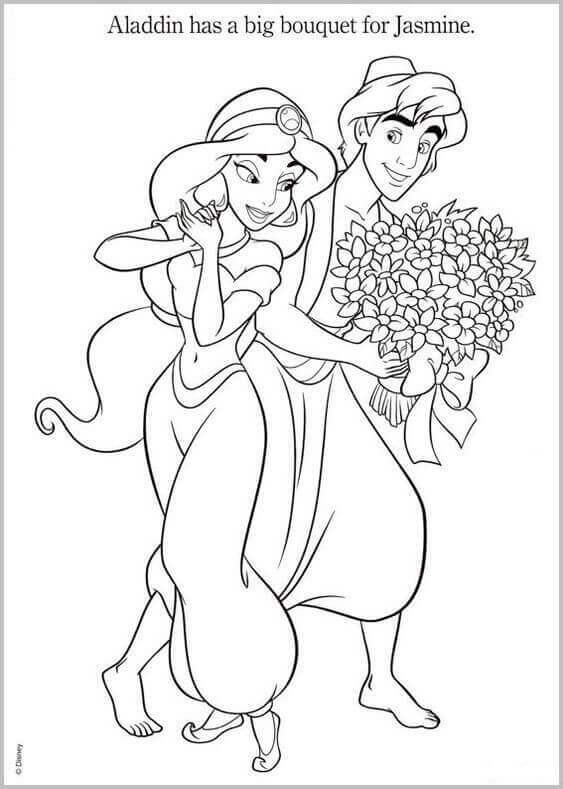 Aladdin here has come with a big bouquet of flowers for Jasmine and she looks so happy to receive the floral gift. Give this illustration along with the flowers the colors you desire. 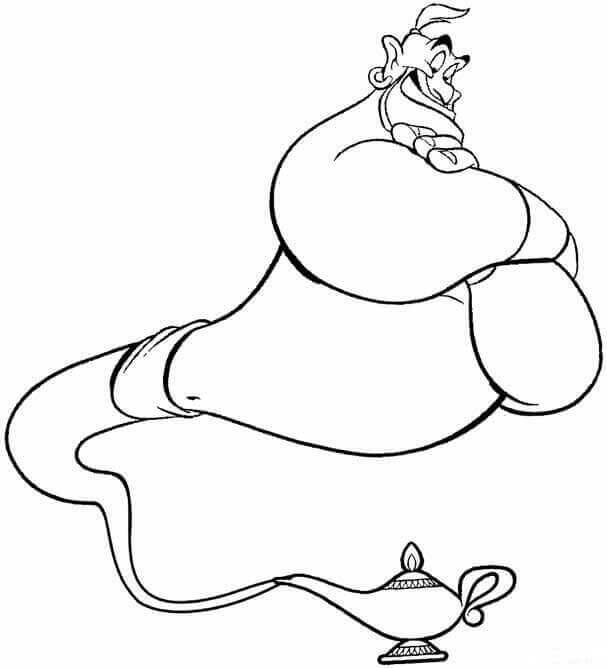 Three wishes were granted by the genie after Aladdin rubbed the magic lamb containing the genie. 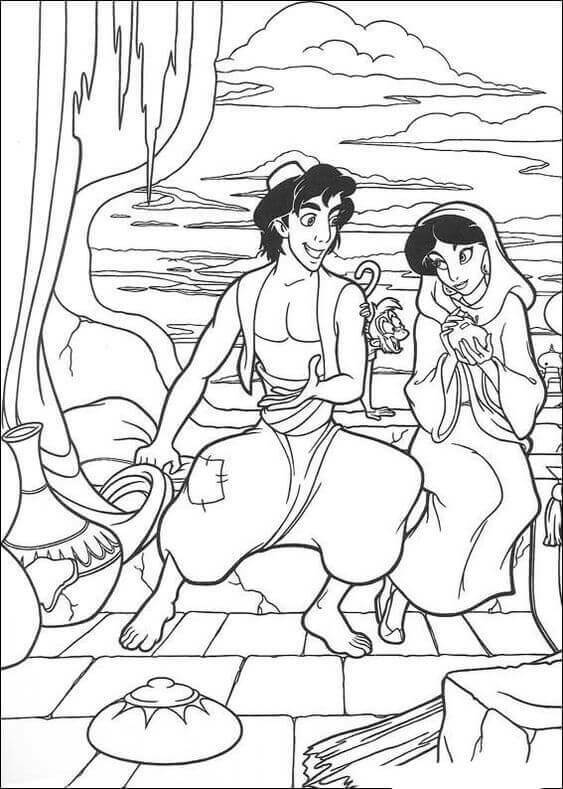 Aladdin’s first wish was to become a prince so that he can marry Princess Jasmine. Looks like the genie’s magic is working. Aladdin is looking like a prince already. Once Aladdin gets his situation sorted, about being a prince, finding the genie and all, there is a strong bond they start to share. Even genie seems to have developed a strong connection with them all. It’s like how your best friends were once strangers but have now become an important part of your life. Life never stayed the same once Aladdin and Abu found the magic lamp containing Genie inside. They go through a series of adventures together and start to form a great bond. When Jasmine took Aladdin’s hand and went on board the magic carpet, she didn’t realize she would find such a wonderful view of the whole city of Agrabah. All this while she had been living within the confines of the palace, kept from the world outside. Now, thanks to Aladdin, she can see her city in a whole new way. Aladdin was recruited by Jafar, the Grand Vizier of Agrabah, in disguise to get him the magic lamp as the Cave of Wonders would not let him inside. 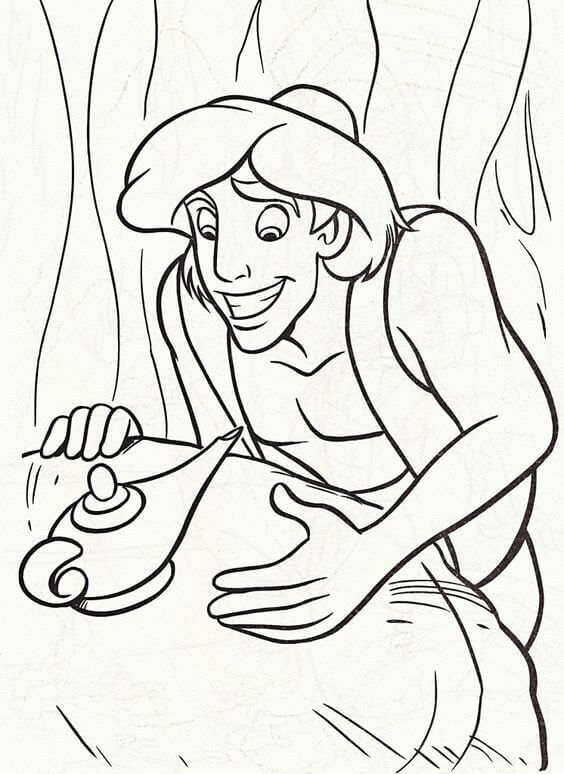 Here is Aladdin taking his first look at the magic lamp, and as expected he is fascinated by the shine on it. As they went about their day, under the warmth of the sunshine, Aladdin, Jasmine, and Abu are having a great time together. When you are with your friends and your loved ones, you are bound to have a good time. Look at them dancing happily in the sunshine. 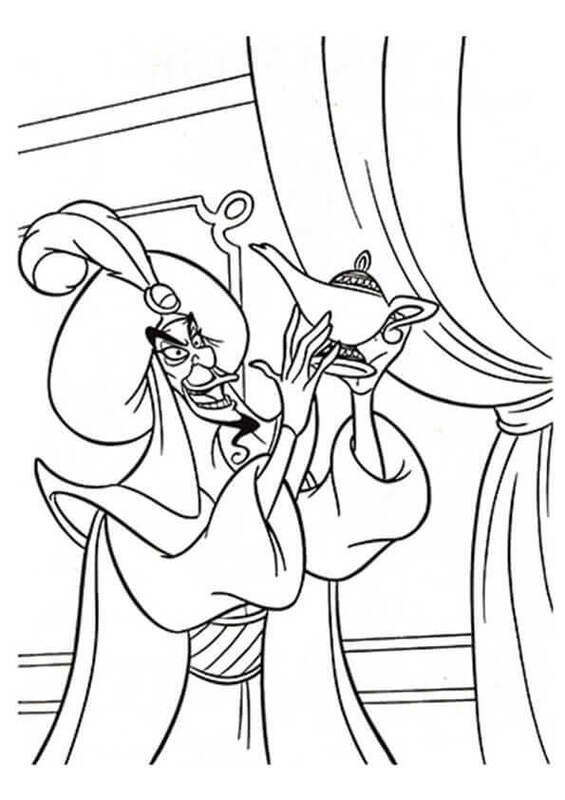 First introduced in Aladdin and the King of Thieves, the second sequel to Aladdin, Cassim is the King of Thieves who came to raid Aladdin and Jasmine’s wedding not knowing it was his son’s wedding. It turns out that Cassim is Aladdin’s father who had left him as a child. 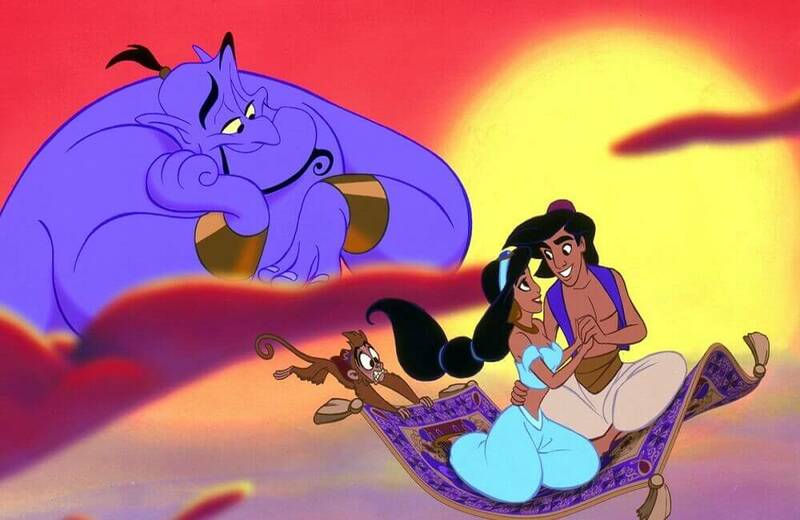 It really was a magical ride around the world when Aladdin and Jasmine first flew together on the magic carpet. 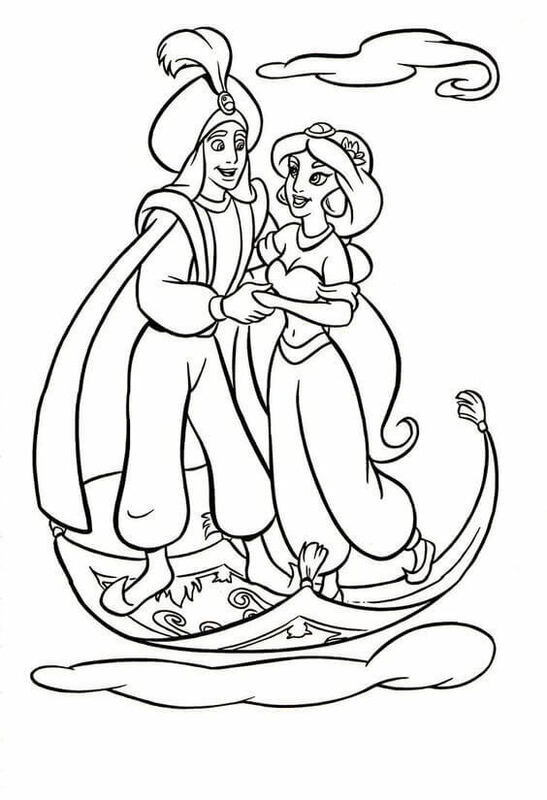 Here you can see them in this illustration traveling to the river in some foreign land, and the magic carpet flew so low as to let them touch the water. Print this page and give it some beautiful colors. 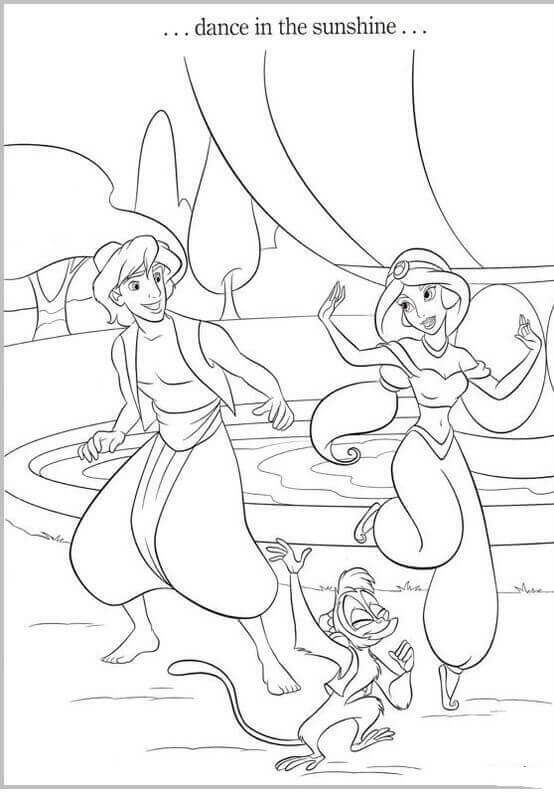 This illustration brings together most of the wonderful characters from Aladdin in an interesting way. Genie here holds up Aladdin, Jasmine, and Abu on his palm while the flying magic carpet and Iago, the parrot flies around him. Appreciate these characters by printing and coloring this page diligently. The moment he laid his eyes on Jasmine as a bride, Aladdin felt she was the most beautiful bride ever. Everyone in the palace is celebrating this auspicious union of love made possible through a series of adventures. Print this page and give the groom and the bride a wedding gift of colorful detailing. 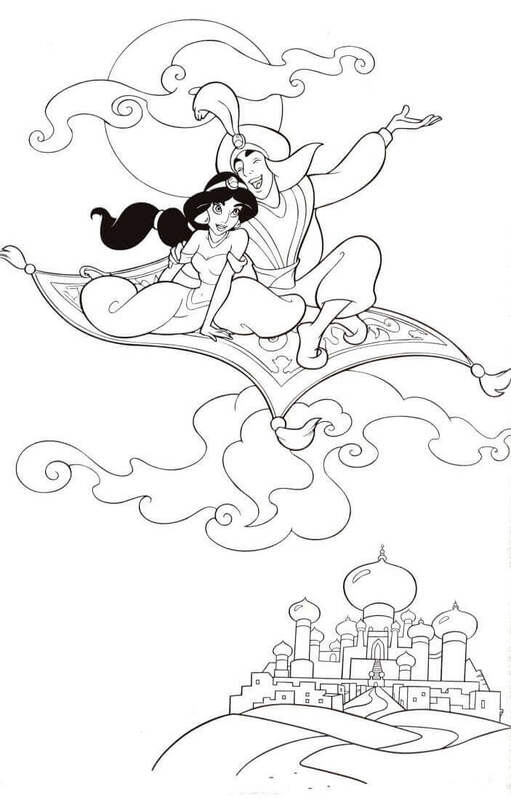 The theme song of Aladdin “A Whole New World” plays during the scene when Aladdin and Jasmine are flying on the magic carpet. The song has the distinction of being the only Disney feature film song to win the Song of the Year Grammy Award till date. Always resourceful and full of lively spirit, Genie was created to be comedic with the power to grant the wishes of his master. When Aladdin rubbed the magic lamp in the Cave of Wonders, he became the master of Genie who appeared out of the lamp. 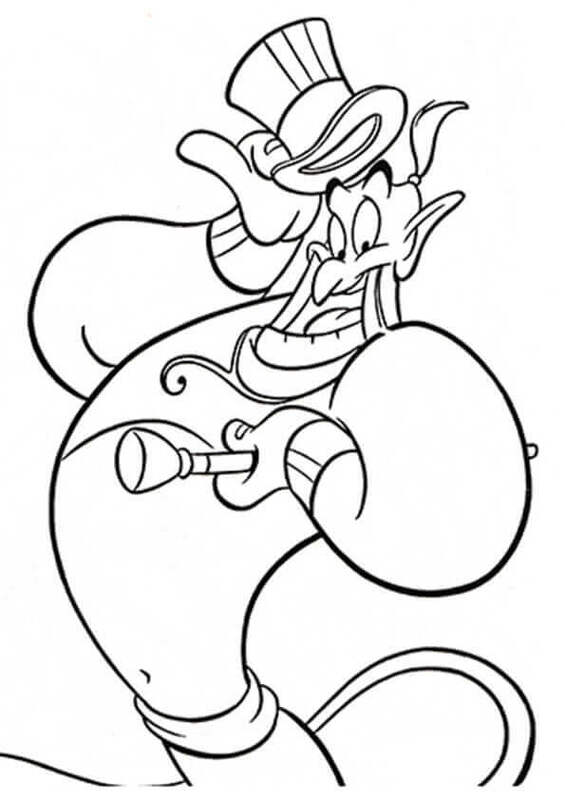 Showcasing how Genie comes of the magic lamp is this illustration where only the upper body is prominent, and the rest continues to be smoke coming out of the lamp. The character in the movie was voiced by the legendary actor, Robin Williams, turning Genie into one of the most loved characters in Disney. 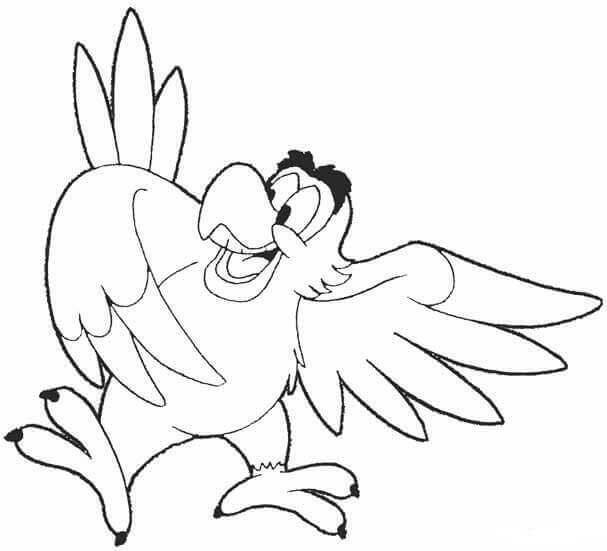 For a change, this illustration shows the funny and jovial side of Iago, the parrot assistant of Jafar, the Grand Vizier of Agrabah. 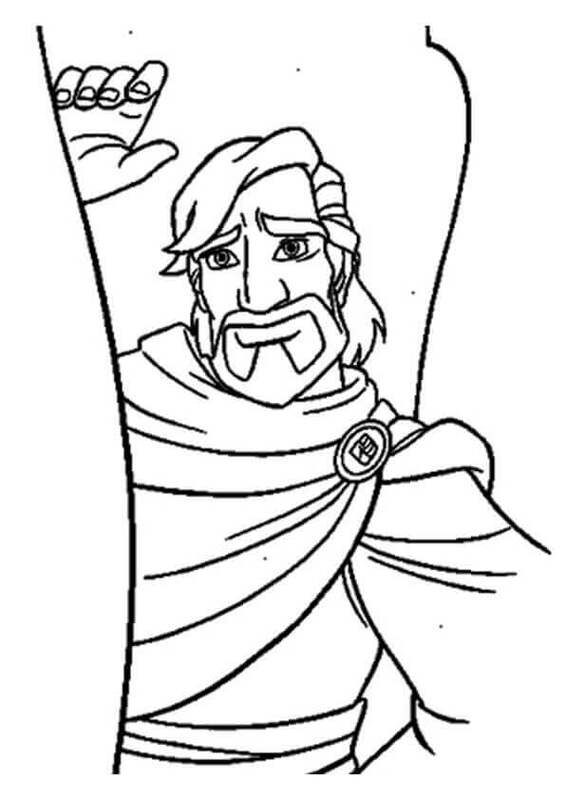 Usually throwing fits of anger and unruly mocking remarks, Iago looks happy dancing on this coloring page. Print this page and add some surprising dancing colors to this illustration. Planning to become the Sultan of Agrabah someday, Jafar had tricked Aladdin to go inside the Cave of Wonders and fetch him the magic lamp. 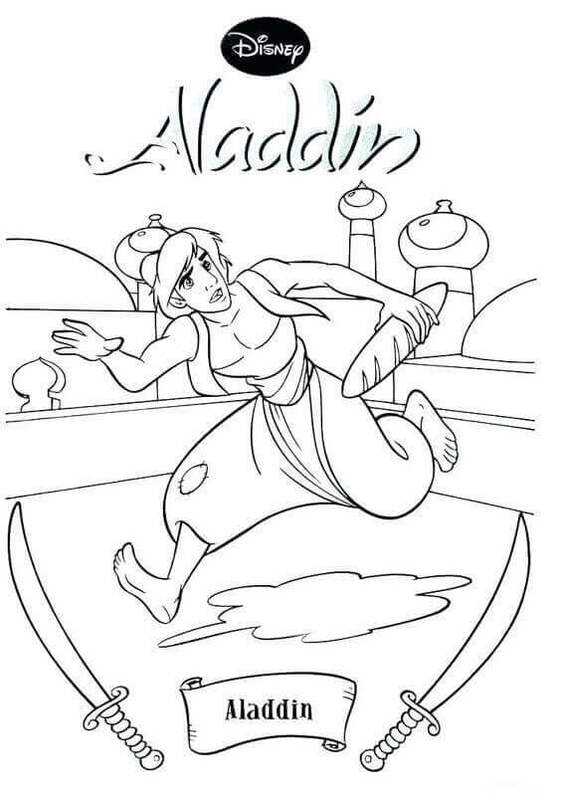 Aladdin used the lamp to become a prince and later exposed Jafar. 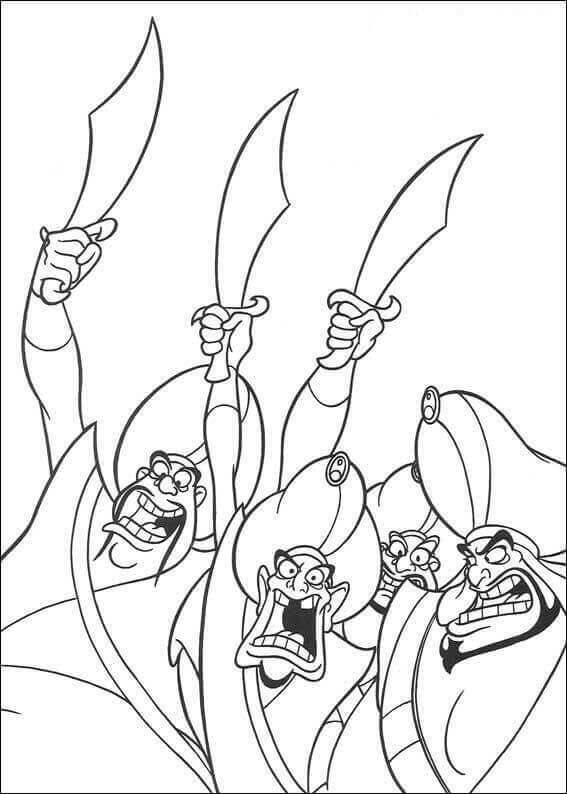 However, Iago steals the lamp for Jafar who wishes and becomes the new Sultan as well as the most powerful sorcerer. Aladdin and Princess Jasmine’s tale of love, magic, and wonder is part of Disney’s series of animated feature films being remade into a live-action feature film. Very soon you will be seeing them come alive on screen, much like “Cinderella” and “The Beauty And The Beast”. 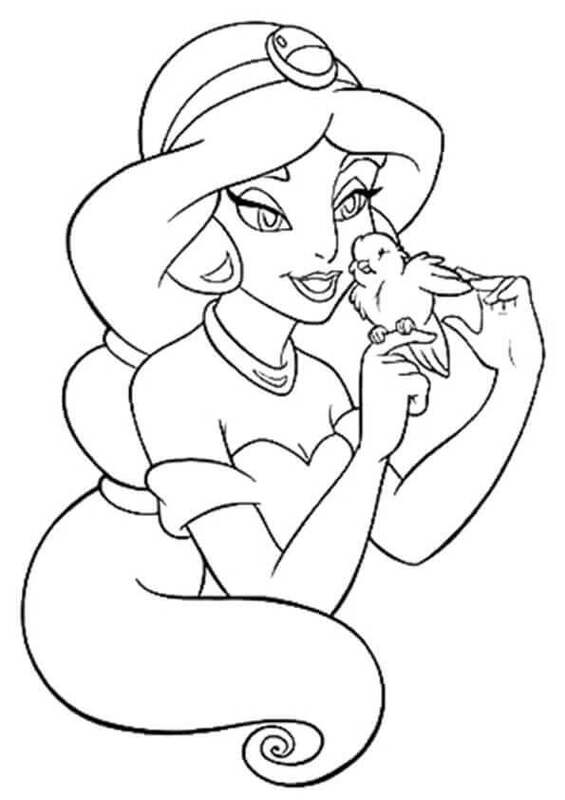 Strong-willed and adventurous, Princess Jasmine feels confined within the walls of the palace. The many wonderful creatures inside the palace keep her company and give her some solace in life. Like this adorable little bird. Princess Jasmine is a Disney princess as brave as they come. Fearless too. Here she is enjoying her time with the tigers kept within the palace. She shares a special relationship with them. They are her companions and protectors too. Print this page and give this illustration some bold colors. 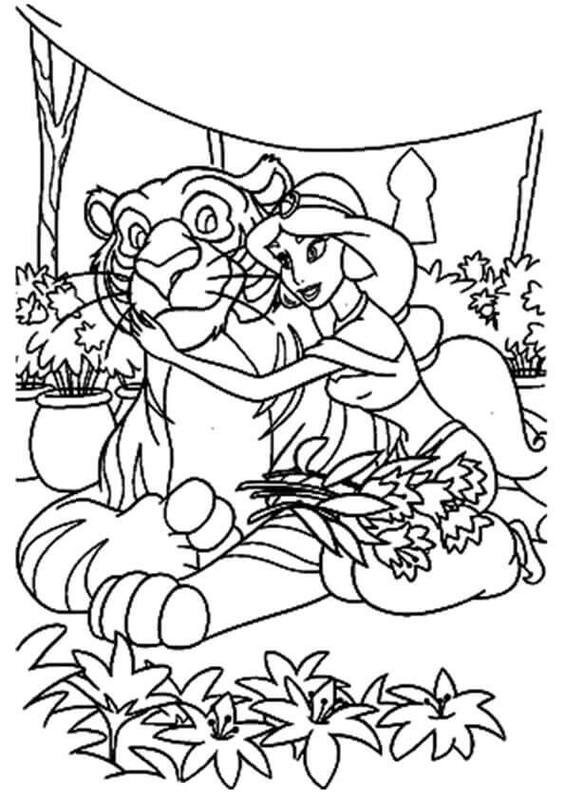 Although Princess Jasmine loves all her birds and animals, she has a special place in her heart for Rajah, the tiger. Here they are in the palace garden and the mutual love for each other is evident in this illustration. Print this page and give this special friendship your special colors. 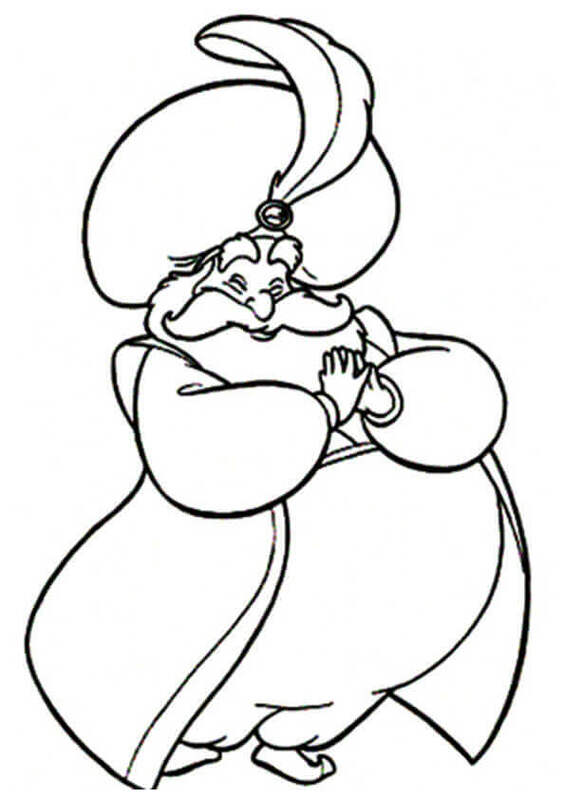 The Sultan of Agrabah and father of Princess Jasmine is a kind and friendly ruler. However, he is very impressionable and easily influenced by others. 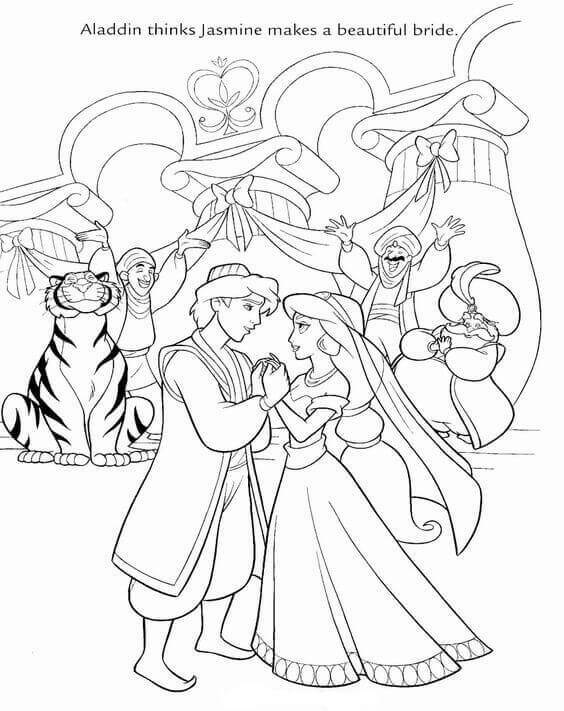 Trying to follow the law of the land, he is desperate to find a prince to marry his daughter, while all Jasmine wants is to have freedom, even in the choice regarding whom she marries. 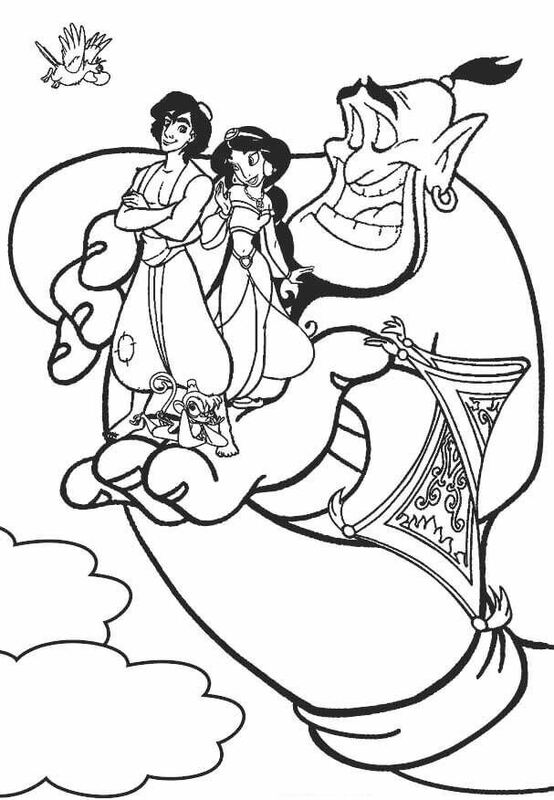 With that, we have come to the end of today’s collection of Aladdin coloring pictures printable. This coming summer is going to be blockbuster time. Get ready to enjoy lots of fun, adventurous and magical live-action Disney movies like Tim Burton’s “Dumbo”, “Toy Story 4” and a live remake of “Aladdin” directed by Guy Ritchie which is scheduled to release on May 24, 2019. You must be getting excited from now onwards just thinking about summer reading this information. 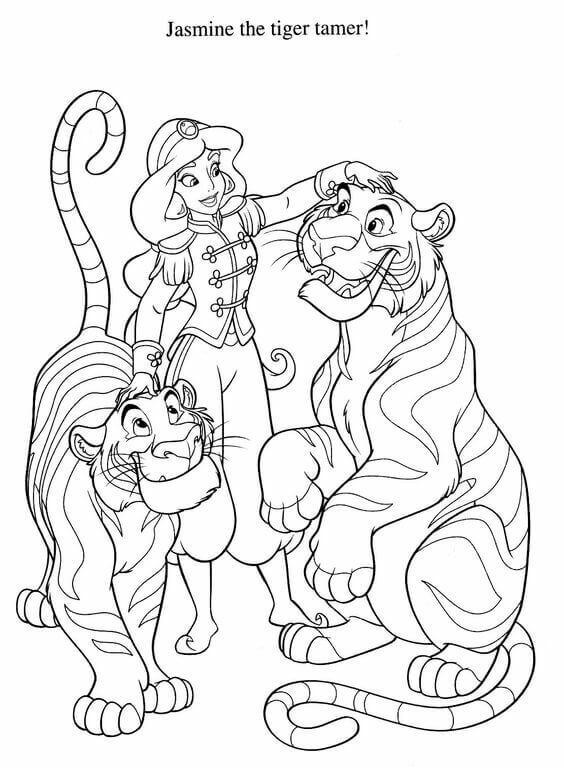 While you look forward to having an entertaining summer this year, you can have a fun time coloring the collections of coloring pages we have of all these movies. 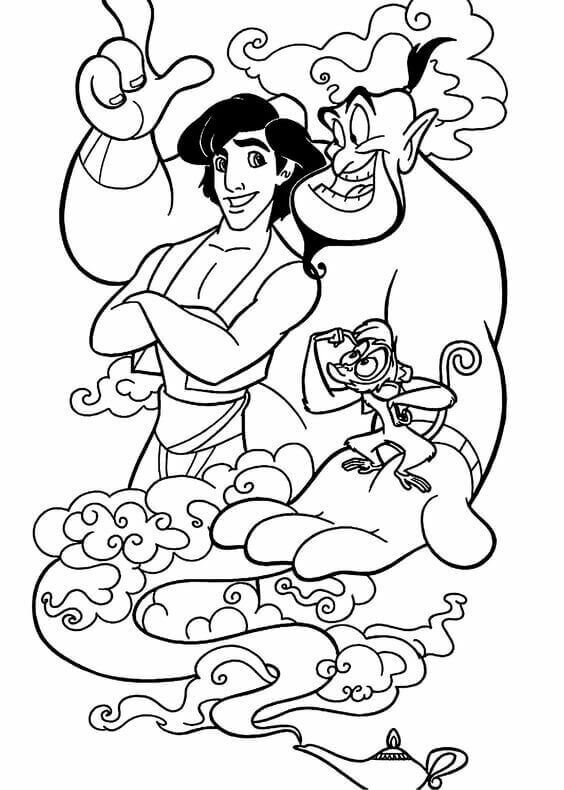 You can start with this magical collection of Aladdin coloring pages to print.